When George W. Bush attacked Iraq and the Saddam Hussein regime, millions of Americans rejoiced as the president took unilateral measures to overthrow the evil dictator’s powerful hold over the country. Bush was successful with his stated goal, regime change, but for Iraqi Christians, life would never be the same. One 2016 publication stated the Christian population in Iraq fell by 80 percent in just a decade following the US invasion. CNN stated Christianity was “in peril” after ISIS took control of the country. And The New York Times questioned if this generation would see the end of Christianity in the Middle East. Oh how quickly it seems American Christians forget the toll taken on their Middle Eastern brothers and sisters when regimes change, and terrorists take over. But that is precisely what will happen if the United States has its way with Syria, the way it did in Iraq. Yet it seems millions of American Christians have pledged their prayer support for the president’s preemptive strike on Syria. Evangelist and pastor of Harvest Church, Greg Laurie, issued the following statement. The United States of America has struck chemical and weapons sites in Syria with Tomahawk and Cruise missiles! Pray for our leaders and military and the innocent victims of Syria! May God protect and bless the United States of America. Before any official investigation was conducted by anyone to determine whether or not it was moderate rebels, ISIS rebels, White Hats (many of whom are self-professed former rebels), the Russians, or the Syrian Army, who was responsible for the gassing, Donald Trump and his war machine began dropping bombs on Syrian airfields. Yet, powerful Christian leaders, such as Laurie, have swallowed the U.S. government’s narrative, hook, line, and sinker. The blind belief in the U.S. government’s narrative belies the fact the government has lied to the American people before in an attempt to have their way with the world’s dictators. The Bush administration said Saddam had Weapons of Mass Destruction (as in nuclear weapons), but there were none. After the invasion was complete, a mad search was conducted and there were no weapons of mass destruction found. Praying for the Children in Syria and our US Military Forces. But what if both Laurie and Burns changed their prayers to include the Syrian Christian Church? How would that simple change affect the narrative? If you speak to Iraqi Christians today, they’ll probably tell you they wish the Americans never dropped their first bombs in Iraq. While Saddam may have been an evil tyrant and ruled with an iron fist, the Christian church and population in Iraq never suffered the genocidal fate it now confronts. The jihadist rebels of Hay’at Tahrir Al-Sham and the Free Syrian Army (FSA) launched several artillery shells towards the predominately Christian city of Mhardeh in northern Hama today. As a result of today’s attack by the jihadist rebels, the St. George Roman Orthodox Church inside of Mhardeh was damaged, along with several buildings nearby. 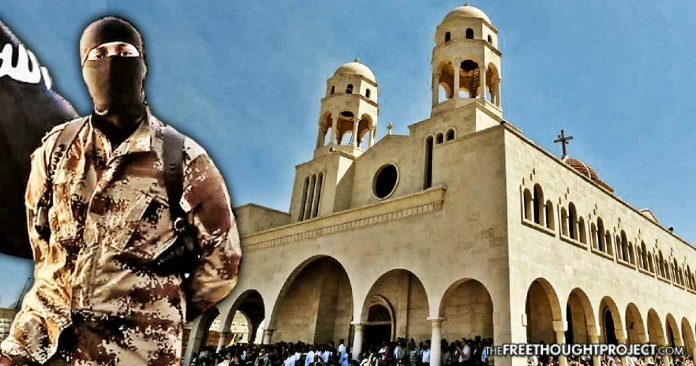 According to local activists in northern Hama, the jihadist attack on Mhardeh wounded at least a dozen civilians that were in the vicinity of the St. George Church. Christians need to be reminded that the same level of decimation, which happened to the Iraqi Christian population, will occur with the Syrian Christian population and has already taken place throughout many areas in Syria, thanks in part to U.S. sponsored “moderate” rebels. The facts are, even as Bashar al-Assad told Barbara Walters in a 20/20 interview several years ago, Syrians are also fighting the war on terror against Islamic extremists hell bent on destroying their country. And, if House Representative Tulsi Gabbard and Senator Rand Paul are to be believed, the U.S. is funding the extremist groups which are also attacking the Assad regime. Now, it seems, the country has to worry about a full-blown military invasion of Syria. Standing in the way of the USA and its desire to see regime change take place in Syria, are the Russians, the Iranians, and the silent but highly effective Chinese. It sounds like the making of World War III. If American Christians really want to make a difference to keep their own country out of war, they need to call their congressmen and begin to voice opposition to any military incursion in Syria, and start to pray for the Syrian Christian Church which is on the brink of becoming extinct.